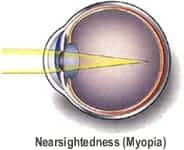 Refractive errors exist when the cornea and lens of the eye fail to focus light rays directly on the retina. 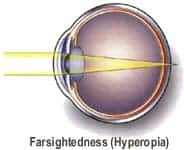 This can result when the cornea is too steep, focusing light rays in front of the retina (near-sightedness aka myopia) or if the light rays are focused behind the retina (far-sightedness aka hyperopia). 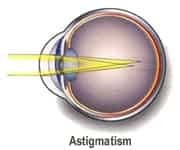 Astigmatism results when the cornea-lens combination fails to focus the light rays to a point source on the retina. A normal circular or spherical cornea focuses images to a sharp point. A cornea with astigmatism is essentially oval and therefore fails to focus images clearly, resulting in blurry vision. Near-sighted individuals can see near, but not as well far-away. Far-sighted individuals see better far away, but more blurry close-up. Presbyopia is the condition associated with aging whereby the ability to see fine detail up-close becomes increasingly difficult after the age of 40. This age-related process is due to a weakening of the focusing muscles in the eye. Presbyopia is part of the natural aging process of the eye and affects 100% of the population. Austin Eye is a leading provider of eye care services for Austin LASIK surgery, cataracts and other refractive surgery patients. If you are searching for an eye doctor Austin patients trust to treat a wide range of eye problems, contact Austin Eye today. For those seeking LASIK, see our informative page on LASIK costs in Austin.